APREIS is the Andhra Pradesh Residential Educational Institutions Society, Hyderabad. The APREI Society conducts APRJC CET for admission to residential junior colleges, and APRDC CET for admission to residential degree college, apart from other exams. Students who wish to appear in the common entrance tests conducted by APREI Society in Andhra Pradesh can apply for the CET. Get here complete details of APREIS including APRJC CET, APRDC CET, application form, admit card, results. There are around 247 KGBVs, schools, junior colleges, and degree colleges under the AP Residential Educational Institutions Society. The official website of APREIS is www.apresidential.cgg.gov.in. Admission related information is updated timely online for candidates. APRJC-CET-2019 Entrance Examination Date will be announced online. Candidates may choose any District to appear for Test. Applications are invited through Online from the students appearing for SSC March 2019 or equivalent for admission to AP Residential Junior Colleges for the year 2019. Long-term Intensive Coaching will also be given for EAMCET and CACPT at all the above Jr. Colleges. 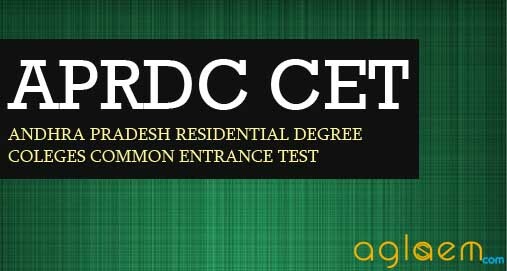 APRDC CET 2019 Entrance Examination will be conducted on the yet to be announced date at all District Head Quarters of Andhra Pradesh and Hyderabad and Warangal Centre of Telangana. Applications are invited through Online from the students appearing for Intermediate Public examination 2019 for admission to AP Residential Degree College, Vijayapuri South, Nagarjuna Sagar and Silver Jubilee Govt. College, Kurnool for the year 2019. 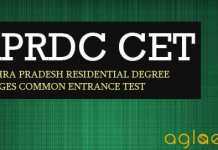 Click Here for RDC CET Complete Information. Selection of Students will be made based on the merit in the Entrance Test, Community Reservation, Local Area, Special Category etc..